Mark Forest is the muscle-bound hero in an Egyptian set Peplum from director Carlo Campogalliani. Retromedia US R0 DVD. While traditionally associated with Classical Greece and Rome, the 1960s Peplum films saw a variety of creative settings from fictional Atlantis (Il conquistatore di Atlantide (1965)) to the Orient (Maciste alla corte del Gran Khan (1961)) but often the settings made little difference to the storyline - Son of Samson is a case in point, despite a less common Ancient Egyptian settings, its storyline is a pretty typical genre entry following the usual 'good king being repressed by an evil ruler and needing a convenient muscle-bound hero to fight off waves of surprisingly motivated guards and save them' pattern. Fortunately the storyline, co-written by genre veteran Ennio De Concini (Le fatiche di Ercole (1958)) is solid and has enough ideas to keep things moving throughout with a good balance of plot and peck-flexing action scenes. Despite the presence of a legendary hero, Son of Samson has some scenes of surprisingly brutality and has the atmosphere more of a historical epic (although at least in the English dub, the opening dialogue incorrectly sets the film in the 11th Century BC - the Persian invasion was much later in around 500BC). Maciste nella valle dei re is notable for being the first of the Maciste films to be made in the Peplum era. Maciste was a heroic character created for the Italian silent movie Cabria (1914) and spun-off into a lengthy series of films in the 1910s and '20s, its enduring popularity meant that it was quickly resurrected in the Peplum boom and with the character having no historical restrictions it would often be used for the Pepla set away from Greece and Rome. Unknown outside of Italy, most of the Maciste films would be renamed and redubbed to use names more marketable to Anglo-American audiences, such as Atlas, Goliath and Samson - in Son of Samson, a brief voice-over explains that Maciste is considered to be the son of the biblical hero (although why the son of an Israelite would be living in Egypt is never explained) but he does retain the name Maciste, making it one of only a few films to do so in their English dub. Veteran director Carlo Campogalliani had actually worked on some of the original silent Maciste films, including Il testamento di Maciste (1925) and does some very good work here. The Egyptian sets look beautiful including some very large scale exteriors and a real highlight is a sequence showing an obelisk being put into place, a few second-unit scenes filmed in front of the Giza Pyramids also help to build the atmosphere. To underscore the brutal script there is an unusual amount of blood in the battle scenes with a lot of quite graphic (for the genre) close-ups. Some sources list Mario Bava as a second unit director on this film although there is no real indication of his involvement. Genre regular Carlo Innocenzi provides an effective soundtrack with some well used religious chanting. One of many well-built American actors to make the flight from the US during the Peplum boom, Mark Forest moved on quickly from his indifferent performance in La vendetta di Ercole (1960) to this much better showing, although the script is hardly demanding on his acting talents. Exotic dancer Cuban Chelo Alonso makes for an effective evil queen and it is no real surprise when she gets a seductive dancing sequence. 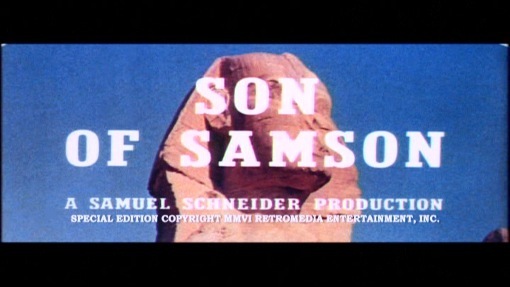 Despite a rather generic plot, Son of Samson is well written and has a beautifully realised Egyptian atmosphere with Mark Forest making a good Maciste. Not among the genre's best but certainly high on the recommended list for Peplum fans. Anyone else involved? Mario Bava - the Italian horror maestro started his career photographing a variety of Pepla. Any gore or violence ? A number of unexpectly bloody and violent shots. Who is it for? A well made entry that should appeal to all Peplum fans. Generally good looking print with decent colours and a decent amount og detail, although there is colour variation and minor print damage throughout and there looks to be slight cropping at the top in a few scenes. Audio English mono - sounds good. Original English language trailer with a wonderfully over-the-top narration. Good quality, anamorphic widescreen. Availability Only available as a two-film set with Son of Cleopatra on a two-sided disc. Cuts? Cut status unconfirmed, the film might well have been edited for US release - there is one shot where a character is about to expose her breasts to prove herself female that looks to be cut. The print used is English language. Not too original, but well written and boasting some great looking Egyptian sets. One for all genre fans. A good sounding and more than reasonable looking print. See our reviews of more Peplum DVDs. All text in this review written by Timothy Young - 7th February 2011.